It's been to quiet in these parts for my liking so it's with great pleasure I get to review three new United Bricks MiniFigs kindly sent to us for closer inspection! We have a mixed little lot standing to attention on AWNT's specially built parade ground. I've just been informed there was nearly fisty cuffs between our little heroes today due to communication problems. Well what do you expect when you have an American a Scot and a German! I do believe it was over todays date, read on and you'll understand why there maybe some disagreement over it. Coupled with the obvious language and accent issues I'm not sure why I didn't see this happening. So I've called in two interpreters an American who can speak and a German who can speak English. The Scot can actually speak German and understand American but no one can understand him! I do know he didn't take kindly to being called English by the German and a Scotch by the American! All very complicated! Anyway onto business! First in line and looking perfectly turned out is our DAK MG Soldier. 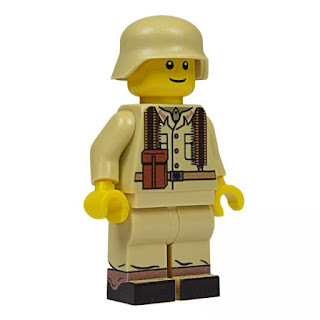 DAK or better known as the Afrika Korps was the German expeditionary force sent to Africa to help strengthen the Italians, who more than likely would have been in trouble as the Italians were woefully equipped for War on any of the fronts and remained so throughout the conflict. 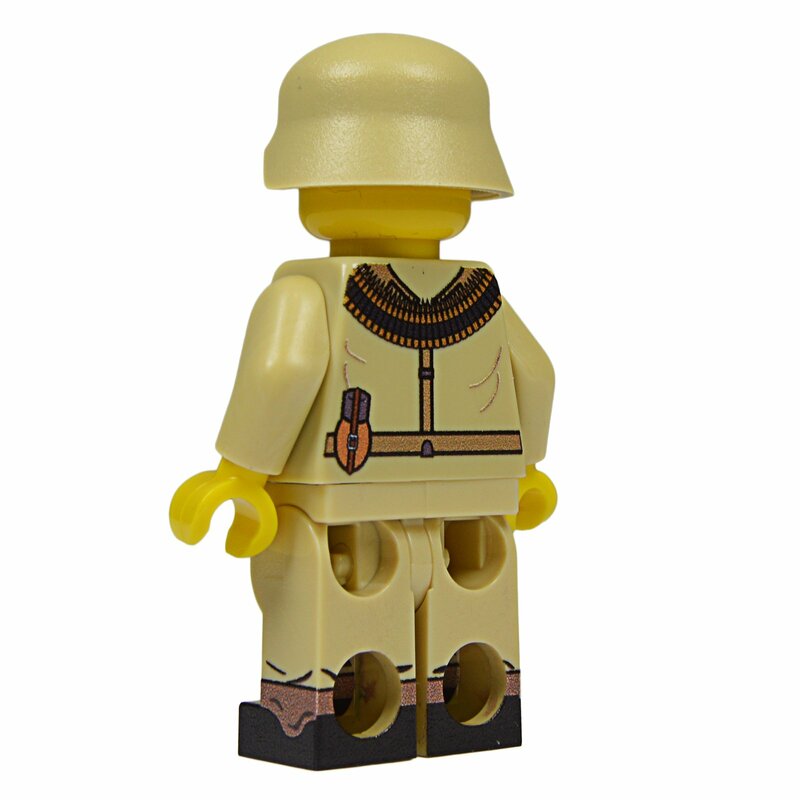 I'm sure most people have heard of the Afrika Korps enigmatic leader Erwin Rommel. Many books have been written about the battles between Rommel's Afrika Korps and the British 8th Army. He is wearing, with pride I can see, his Afrika Korps uniform. He is one of Rommel's finest. The DAK uniform is the perfect colour for desert warfare. He is well prepared to man the MG with an ammunition bandolier across his shoulders. As per usual with United Bricks the printing is top quality, nice and clear and highly unlikely to wear off with handling. Judging by his smile I reckon he is fighting out there in the desert during the height of Rommel's powers, or he came out on top in the earlier..shall we call it a heated difference of opinion..ahem! Maybe the look on the other two faces will give us a clue! He retails at £8.50. You can also purchase three other DAK torsos an Officer, MP40 soldier and a KAR soldier. Next up is a rather upset looking US Admiral! Maybe the German did end up getting the upper hand? Or maybe we are dealing with a hard headed, no nonsense US Admiral. The kind that defeated the Japanese Navy in the Pacific. Looking at him, you'd even say defeated the Japanese single handed. He looks very smart in his all white uniform. Though there is less printing compared to the DAK uniform what looks top quality. 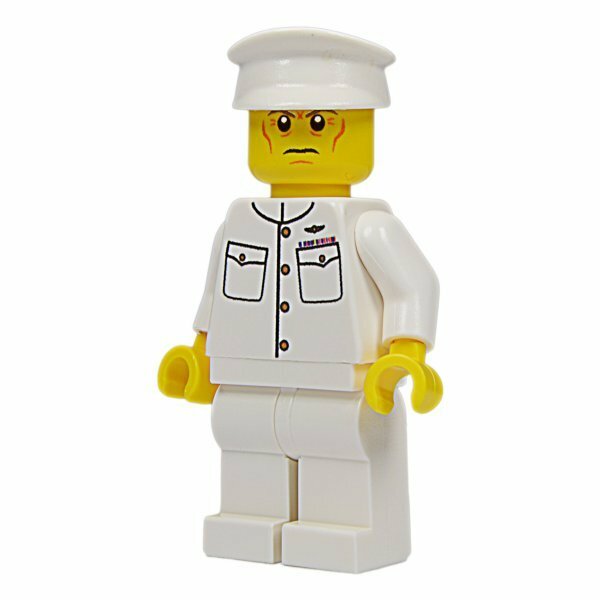 Also the more stark Naval uniform is reflected in his retail price. Last to be reviewed is our Scot! Still smarting from being called a Scotch and even worse English he is also confused about why on earth the American and the German insist they are fighting in the second War, when he is still fighting the first one! Yet no matter how often he tried to explain it didn't seem to register, it's as if he was talking in an alien language! Anyway eventually things got heated and when the Admiral laughed when the German called him English..well what else did he expect other than a Scottish Kiss, or should he say Scotch Kiss! So that explained we have hear a WW1 Scottish soldier resplendent in his kilt, as he belongs to one of the famous Scottish Regiments, though he could just as likely been an Englishman in say the 1/8th Kings Liverpool Scottish battalion. 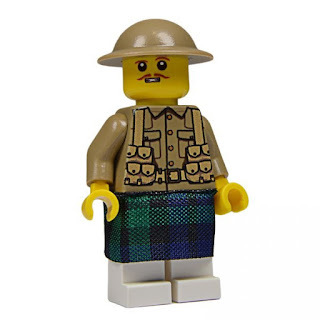 One of several battalions within British regiments that are designated Scottish. As I said though this particular fine specimen is in a Scottish Regiment. His tartan kilt is excellent and a great touch. He is wearing the Brodie helmet which troops starting wearing from late 1915 onwards. Again the printing is excellent quality and really can't be faulted. I also love his very WW1 moustache, plus the raised eyebrow really adds character! He retails at £9.00 and is my favourite Minifig out of the three! 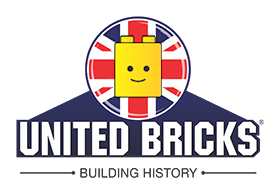 So that's it from United Bricks for now. Head on over to their website and check out many other figures aswell as a great selection of WW2 vehicles, including tanks!